The Nation Corvette Restorers Society has selected CarArtWork to create an exclusive line of logo items for its' membership. Fashioned in steel, and beautifully hand-finished, these distinctive collectables will be treasured for years to come. The Fender handbag is fashioned from two NCRS license plates wrapped around chrome teardrop-shaped hubcap ends to create a one-of-kind fashion statement, featuring a crystallized twist-knob closure, a fully-lined velvet interior with velvet pocket and a 21-inch recycled rubber strap. 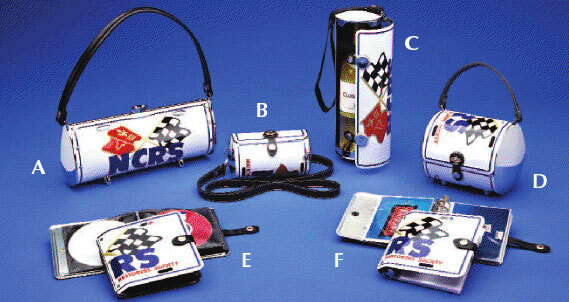 A NCRS license plate is wrapped around two 4-inch chrome hubcaps to create this petite handbag. The Cyclone features a plush felt lining, an elastic lipstick holder, a bottle cap snap closure and a 48-inch rubber strap. 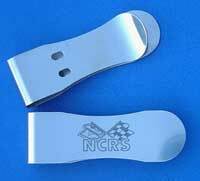 Load your CD’s in this stylish and unique CD organizer made from a NCRS license plate. The insert holds 20 CDs and it’s all held secure with a recycled rubber snap closure. A NCRS license plate is folded in half to create an album that holds 36 4”x6” photos. A recycled rubber snap keeps your photos secure.